Why did Jean Paul Gaultier employ 51-year-old Inès de la Fressange? 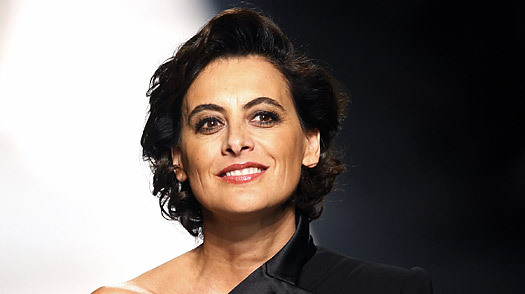 At the recent Spring/Summer 2009 Paris Fashion Week, Jean Paul Gaultier had 51-year-old former high-fashion model, Inès de la Fressange, model one of his designs on the runway. Fashion models are not just 14-year-olds. There are no [age] barriers to beauty. Gaultier even said that Inès de la Fressange embodied the sexuality demanded of his Spanish themed show. I think he wanted to show that he is working for women, he is at their service, if you like. I like the fact that he didn’t try to disguise me or make fun of me in some way, by making me wear black nail polish like the other models. Jean Paul Gaultier sent 51-year-old model Inès de la Fressange down his runway in Paris, proving yet again that he puts his money where his mouth is when it comes to highlighting beauty that falls outside the industry standard. Here is the reality. If Gaultier had any intentions of making a statement against ultra-thin models, he would have chosen models with normal, healthy body weights and stuck with it. Seeing young adult attractive women with a body mass index of 19-21 on the runway would shatter any pathetic excuse the fashion industry has come up with regarding a need for ultra thin models (see examples in Table 2 here). Body mass index is the height in meters divided by the square of the weight in kilograms; most people in Western societies, both men and women, find an optimally attractive BMI in women to be close to 20, biased more toward the 20-21 range rather than the 19-20 range. Choosing morbidly obese Velvet D’Amour made no statement whatsoever against the use of very thin models because most people in Western societies find obesity unattractive. And now Gaultier takes a stab at age. Again, all he had to do was pick fresh/unknown attractive models in the age range 20–25 and with a healthy body weight, and exclusively use them for his show. This would destroy any justification that the fashion industry has put forth regarding using 14-year-old girls for modeling clothes aimed at adult women, among whom the young adults are underrepresented because they are less likely to have disposable income for more expensive fashion merchandize than older women. But Gaultier went for a 51-year-old woman. Most people in Western societies find adult women at their peak attractiveness in the early- to mid-twenties, and employing middle-aged women as models will do nothing to change it. My argument is not that obese or middle-aged women should not be employed as fashion models. There are surely large numbers of both kinds of women who would not mind looking at how their own bodies would appear in the clothes or other fashion merchandize they are thinking of buying. But I wish to draw attention to what Gaultier and other industry homosexuals are doing: faking concern and understanding. Gaultier has not made an obese model a staple of his fashion show and neither will he regularly employ middle-aged women. The biggest obstacle to the promotion of healthy beauty within the fashion industry is the dependence fashion has on advertising. Since magazines are dependent on the advertisers to exist, this beholds them to adhering to what has become the yawningly boring average--thin, white, tall and young. The reason being is that ads are so costly that they fear taking risks and as such, the vision of beauty is preserved as not only unattainable (to promote the use of the materials being sold) but also staid, since they are afraid to rock the boat and want only what sells. No wonder she let herself be ridiculed by Gaultier and the fashion industry, like Beth Ditto. Thinness doesn’t sell, and advertisers are not the culprits until they happen to be male homosexual fashion designers who like the looks of boys in their early adolescence, which is the reason why they pick female models that come close to this look. # 1 | Submitted by Barbara on Mon, 02/09/2009 - 19:09 | goodness! love your site. I agree with a lot (most, I think) of what you say. I often find myself over-analyzing myself in the way you analyze the models and other masculinized women. Part of me is grateful that the popular aesthetic is that of a masculinzed one, but that is out of selfishness and insecurity of my part-- I would feel even uglier if the truly beautiful and feminine women were being idolized in popular culture! pathetic? maybe, but honest. I only wish there was a way to redo my development in the crucial years (I have polycystic ovarian syndrome--a insulin and hormonal imbalance). I am an artist so I appreciate a good archetype as far as genders go, and am just trying to come to terms that my own body will never be what I wish. Wondering, do you not see it as perhaps a slow step towards something more realistic when people in the industry do something outside the norm? Maybe JPG won't make a difference, but maybe other designers will be inspired to try something different? Like all the rest of these fashion designers he prefers very young, anorexic and masculine models. A few times he apparently throws in a couple of oddballs, a fattie and an oldie (as he considers them, no doubt), just to show us that he is open-minded and not just an elitist homosexual misogynist who greatly contributes to the abuse and self-torture of women. They feel they have to live up to the impossible, masculine, unhealthy and ugly ideal that men like him promote. I am a very feminine looking male (not make up or cosmetic surgery) and frankly look better/equal to many of your models :P, so as i get older i am going to become manlier? What about peak attractiveness for males? same age range? Erik is insensitive to the age of attractiveness issue because he himself was never at his peak of attractiviness. He is 34 years old, but I garauntee you that in those 34 years he attracted a little more than scum. Erik can't attract even the cows he posts on this website, much less a real beauty. And by real beauty, I don't mean a mascuinlized woman. I mean a feminine petite curvy volouptuous woman. Barbara: Jean Paul Gaultier is not really doing something outside the norm or taking a step toward something more realistic. I am sure he had a very hearty laugh, away from public, after ridiculing the notion of heavier fashion models by showing Velvet d’Amour. And he is undoubtedly mighty pleased with showing us how well he appreciates criticism of using 14-year-old girls for fashion modeling. A good analogy is to consider the criminal banking parasites that have caused a global economic recession lately. They are sympathizing with our pain and telling us – usually through their puppets in the government – that they are working toward change or economic recovery, but this requires our cooperation in the form of providing them with hundreds of billions of dollars. What these vile parasites need to be provided with is a rope with a noose at one end that will be gently massaged around their necks. I did mention before that the feminists who complain about body image issues related to the very thin fashion ideal don’t seem to appreciate what wonders the fashion industry does for the esteem of masculinized girls/women. If I had the power, I wouldn’t try to replace it completely, but work toward alternatives. Erik, have you heard about the upcoming documentary, America The Beautiful? In a society where "celebutantes" like Paris Hilton dominate newsstands and models who weigh less than 90 pounds die from malnutrition, female body image is one of the more dire problems facing today's society. "America the Beautiful" illuminates the issue by covering every base. Child models, plastic surgery, celebrity worship, airbrushed advertising, dangerous cosmetics - no rock is left unturned. How much you want to bet that some rocks actually *will* be left unturned by this movie? Fat women all have lumps in different places. Feminine curvy women have bodies that are too different from eachother. It would be a nightmare to finish fitting every single one, especially when everything goes wrong before a show. You need that standard body to be as efficient as possible. Seriously, I do believe fashion models have masculine faces and bodies. Sometimes you can confuse them for men. I think that woman looks good for her age. At least she isn't obese, and at least she tends to herself. She looks elegant in that dress and good for her.. The topic of homosexuality keeps coming up. It makes sense that the industry is dominated by gay men and therefore their taste in women is different than ours’, but has anyone ever made a comprehensive study? As in “the results show that 60% of famous fashion designers have admitted to being gay”, accompanied by a comprehensive list. I’m just wondering if anyone has been systematic about this. Why do you use pictures of african women from the 18-19 century and compare them with white women from 1970 and up? That is like comparing the first Ford model car with a Lamborghini 2010 model!! HOW DO YOU COMPARE THE 2 ARE YOU STUPID? Kindly put some proper pictures of white females of poor (lower class society) from the same period of time or put black women from the 1970+ like you have done for the white women! Get some class, do it right! I hope you have this fixed coz otherwise you had done a good article. I think she's a beautiful model, but this guy is a hypocrite...why didn't he make an entire colection with 50 year old models? He's just a gay clown and she's gorgeous. If she is still very beautiful at 52, what can I say. It's ok, she can be on the runway, I saw the show, she did a very good job. OMG, She does not look like she is 51. # 17 | Submitted by Elenor on Sat, 11/05/2011 - 11:15 | Except, they don't! "There are surely large numbers of both kinds of women who would not mind looking at how their own bodies would appear in the clothes or other fashion merchandize they are thinking of buying." In fact, this is not correct -- it was Lane Bryant or JMS catalog (forget which) that actually tried using "full-figured" (i.e., slightly larger than their "normal" models) to showcase what the clothes they were selling looked like on the body-sizes that seemed like the bodies who'd be buying the clothes -- and their sales dropped off precipitously! They went back to using their usual (not-skinny, but still very thin) models, despite the complaints of the larger women that are their audience. To Elenor 17: It actually IS correct for some women, but because some ppl didn't go for it then it was stopped.